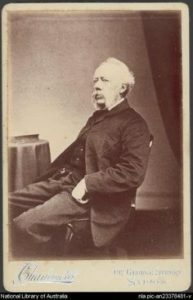 Below is the detailed biography of Conrad Marten, a British painter in the Victorian era specializing in landscape paintings. He spent more than half of his life painting in Australia. Conrad Martens was born in 1801 in London, England. His father was JCH Martens born in Austria and was a merchant in London. His father died in 1816 when Conrad was only 15 years old. As a child, he always knew that he would be a landscape painter since, at a very young age, he showed a flair for drawing and painting. His father encouraged him as an artist. He had two brothers – John William and Henry Martens, also artists in the Victorian Era. In the year 1832, a ship called HMS Hyacinth was about to sail. Conrad was an acquaintance of the Captain of the ship – Capt Blackwood. The ship was to sail to India and Blackwood invited Conrad to join him on a three-year long cruise to India as a ship artist. He made portraits as well as beautiful landscapes for the passengers as well as to decorate his own collections. Through this, he also went on the next cruise, HMS Beagle where the captain was Robert Fitzroy. He was the ship artist here as well. He went to different countries and captured iconic landscapes throughout his journey. 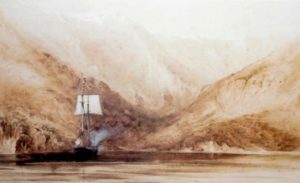 Charles Darwin was on the second voyage on HMS Beagle as well. He was a self-financed naturalist and researcher and spent ample time with Conrad Martens during the cruise. They developed a lifelong friendship with each other. In 1834, Marten got off the cruise on an island – Valparaiso. 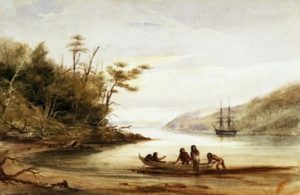 He visited more and more islands in the South sea and finally reached New Zealand. He went to Sydney in the following year. Back then, Sydney was a colony under the UK, and so was India. 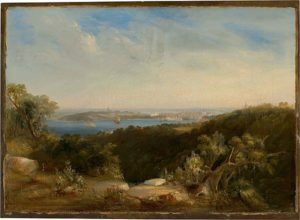 When he visited Sydney, he carried many sketches that were intended to take back to his friend in India but the commissions he received from the people in Sydney was a large sum. He decided to stay in Sydney for the long term. He became a well-known painter in Sydney and was known for his quality of paintings, the accuracy and the use of dark colours in a subtle manner. He was prominent and proficient in his work. After the ship arrived in 1836, the captain commissioned the many paintings that he made while he was on the ship. 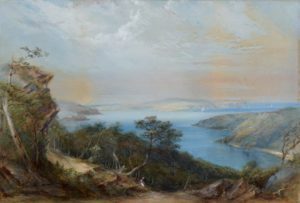 He received large commissions on his Australian Watercolours. Many of his paintings were taken back to London and exhibited at the Royal Academy. Later, he sailed to Brisbane and travelled back by road, on his way he found interesting houses and people, that he decided to use as subjects of his paintings. During these times, he was low on money and was looking to sell his paintings. Eventually, he got commissioned through his watercolour paintings which are in private collections today. 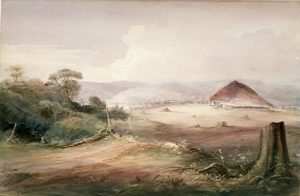 He participated in exhibitions in Melbourne in 1853. His paintings were seen at the Victorian Fine Arts Society and also at the Paris Universal Exhibition in 1855. As the Australian economy became better, his commissions started to increase and life became easier. Around the same time, he was commissioned to paint 70 watercolours. 40 of these paintings exist event today in galleries and private collections. However, for his financial stability, he took up a stable job as the Assistant Librarian at the Parliamentary library. Conrad Martens got married in 1837 to a Welsh woman called Jane Carter. She was the daughter of William Carter – a Barrister in the Supreme Court of New Wales. They married in Sydney on the 9th of March 1837. William Carter purchased Conrad’s famous painting – The View of Tahiti. He was close friends with Charles Darwin, even though he didn’t see him that often due to each other’s distinct lifestyles. They exchanged letters and were usually in touch. In 1862, Darwin wrote to him about the success of the Origin of Species to which Darwin was heartily congratulated by Martens. 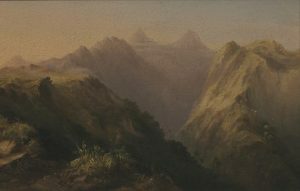 Darwin was also sent watercolour paintings by Conrad Martens all the way from Brisbane to London. Martens died on the 21st of August, 1878 at the age of 76 years. He started to suffer from angina. He died of a heart attack. He died in his house in the North of Sydney in New South Wales, Australia. His burial was a private affair at the St Thomas Rest Park, Sydney. Throughout his adventurous life of exploring and experimenting, he was actually much lesser known. Only after the year 1910, were his works recognised and applauded on a global level. 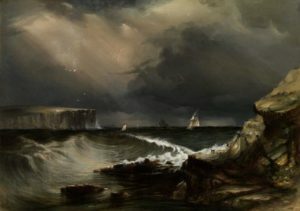 His paintings were also at a high display on the opening of the Mitchell Gallery at the State Library of New South Wales.